I'll admit it, I once played Kim Bauer Drinking Games (Kim is threatened again?! Down the hatch), but after a while the repetitive plots (how many rogue nukes can there be?) and endless commercials put me off 24. 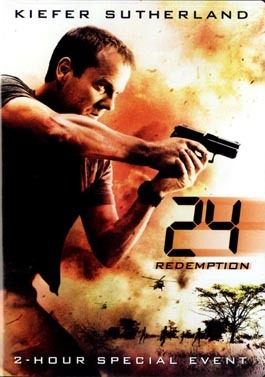 The new 83-minute stand-alone episode, 24: Redemption, reminds me why. Designed to bridge Season 6 and Season 7 (which starts in mid-January), it aired in late November and is now available on DVD for people who were too busy preparing for Turkey Day to catch this turkey. On the run from his own government, Jack is holed up in a remote African village where a fellow ex-agent (Robert Carlyle) runs a school for the underprivileged. African children trail about, playing soccer, rifling through Jack's things and getting pressed into a rebel army led by a dastardly clutch of extreme stereotypes (including Tony Todd of the Candyman series, who deserves better). Back in the United States, President-elect Cherry Jones prepares to move into the Oval Office, which leaves outgoing President Powers Boothe in a frosty snit; Jon Voight sneaks around masterminding some kind of international perfidy. When the soldiers come trolling for child recruits, Jack swings into action, snapping necks with his feet while tied to a torture cage. Alas, he has no time to torture anybody for information, a technique that made this fictional character a real-life hero to some deluded right-wing bloviators. Eventually, lives are saved, villains are dispatched and Jack is ready to face the music back in the U.S. of A. This set includes additional footage, commentary and a documentary about the horrors of child soldiers in Africa. Best of all, Season 6 is condensed into all of four minutes, which is just about right; Season 7 is previewed in 17 minutes: Jack faces a congressional hearing, Janeane Garofalo plays the new Chloe and Tony Almeida returns as a terrorist. Plus ça change, plus c'est la même chose.